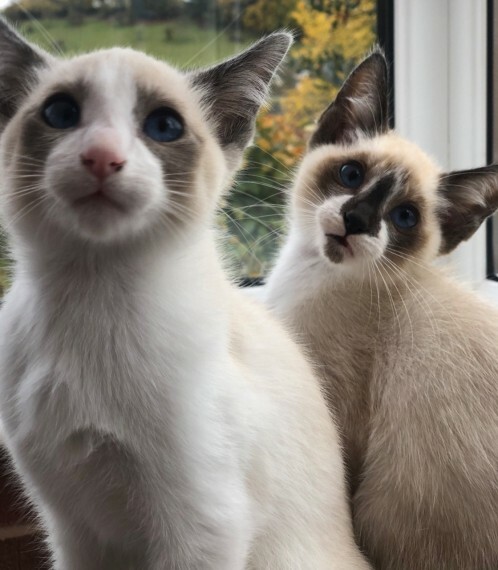 I have two gorgeous Snowshoe Kittens available. these two boys have had the best start. playful. happy. socialised and handled on a daily basis. The kittens have been raised indoors and mum is our beautiful Seal Point Snowshoe .GCCF active registered. and the Father is my super Blue Point Bi colour .GCCF active registered.. The Kittens are being sold to pet homes and have been regularly wormed with Panacur from three weeks of age. flea treated. litter trained and eating dry kitten kibble including kitten meat and now weaned. These kittens are fun and friendly. they will also make a great addition to any new household as Snowshoe cats are intelligent. loyal with super personalities. The kittens are ready to leave now and a non.refundable deposit of fifty pounds will secure your kitten. The kittens will be viewed with their mother and leave with their GCCF registration . non active. a five generation pedigree certificate. vaccination card and a blanket smelling of mum and siblings including a new bag of kitten kibble. These kittens have all been vet checked twice. Fully Vaccinated including leukaemia and leave with four weeks free insurance. Available Kittens. ONE BLUE POINT MALE WITH THE BI COLOUR COAT PATTERN. ONE SEAL POINT MALE WITH THE BI COLOUR COAT PATTERN. If you can offer a permanent loving home then please contact me.